CHOIR Evo is a unique vocal processor that turns a single monophonic voice into a lush choir of 4, 8, 16, or 32 distinct individual unison voices, each with its own pitch, timing and vibrato variations. CHOIR Evo accomplishes its magic with just a few simple controls. Choir Size allows you to select the number of individual voices that will be generated from the original voice. The Vibrato Variation, Pitch Variation, and Timing Variation controls allow you to control the amount of subtle variation applied to each of the generated voices. Finally, the Stereo Spread control lets you spread the voices across the stereo field. 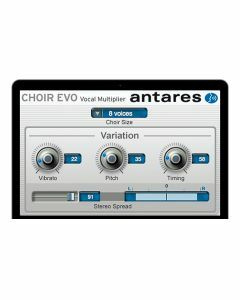 CHOIR Evo is the perfect tool for quickly and easily turning a single voice into a group of voices, each with its own unique character. When multiple instances of CHOIR Evo are assigned to individual harmony parts, the result is an amazingly realistic large vocal ensemble. Choir Size:Â This control allows you to select the number of individual voices that will be generated from the original voice. Choices are 4, 8, 16, and 32 voices. Vibrato Variation:Â The Vibrato control allows you to select the range of variation in vibrato depth applied to the generated voices. Each voice is individually assigned a vibrato variation relative to the original voice. Pitch Variation:Â The Pitch Variation control lets you select the range of the random variation in pitch applied to each generated voice. Each voice is individually assigned a pitch variation relative to the original voice. Timing Variation:Â The Timing Variation control lets you select the range of the random variation in timing applied to each generated voice. Each voice is individually assigned a timing variation relative to the original voice. Stereo Spread:Â This control selects the extent to which the generated voices are spread across the stereo spectrum. At a setting of 0, all of the voices appear in the center of the stereo soundstage. As the value is increased, the voices spread out from the center until, at the maximum value, they appear across the entire stereo soundstage. Choir requires an iLok (not included).